Our stunning Hawaiian Paradise home is located just a few blocks from the waterfront village of Kona, Hawaii in a private gated community of luxury homes. With a nearly constant year around temperature in the 80s, and a cool ocean breeze, this custom Hawaiian home is as tropical as you can get. Overlooking the crashing waves on the lava and sandy beach coast, the home features a designer infinity pool with two waterfalls, a sandy bottom wading pool, huge lanais, and two courtyard ponds with their own waterfalls in a 'Jurassic' garden setting. There is even a private 'island' dining patio next to the waterfall overlooking the dramatic Kona surf. The house comes fully furnished with a designer dream kitchen, open air oceanfront dining room, kitchen bar, living room, entertainment room, an unbelievable Master Suite with panoramic ocean views, a pampered oceanview study, two Tropical Guest Suites, each with their own separate entrance and opening onto the lush courtyard and waterfalls, and a separate Ohana Cottage Suite with its own kitchen, kitchen bar, sitting area and lanai. The master suite comes with its own private whale watching tower! The house sleeps eight, two in each suite plus futons for young children up to 10 years old. 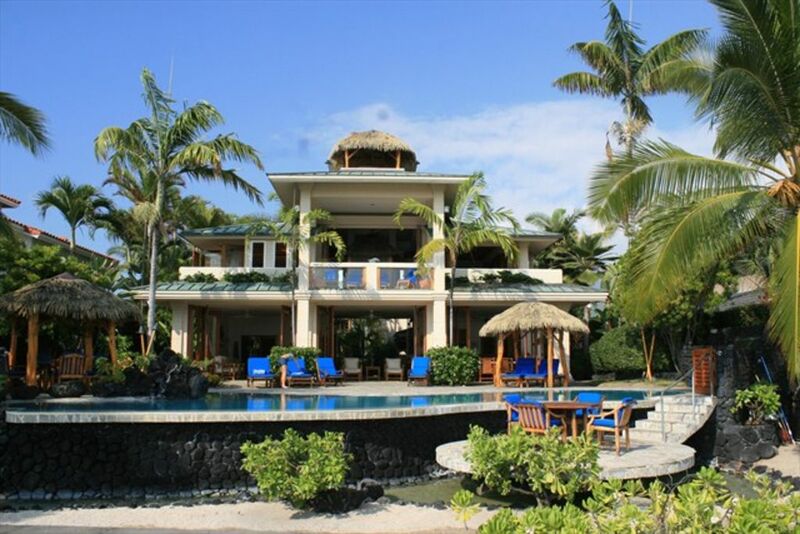 'HALE KONA A'EKAI' is a unique oceanfront private custom home meaning 'the home by the wash of the sea'. It was intricately designed to capture the essence of waterfront Hawaiian living. Thatched ceilings, open walls, louvered teak windows, ten foot teak doors, endless lanais, and tropical landscaping, all help to capture the spirit of the islands. The house is exquisitely detailed with imported teak, bamboo, marble, granite, and quartzite throughout. The home has been featured in several magazines. The grounds are equally impressive with rare tropical flowers and palms, four waterfalls and a stunningly impressive bathing pool with an infinity edge. A stairway bridge takes you across to the island pedestal where you can lavish in a dinner surrounded by water with simultaneous views of the sunset, waterfalls and the crash of the waves! Enchanting, magical and romantic--there is so much more to describe---but you must see it for yourself! Unsurpassed luxury. Come stay with us and experience the mystique and beauty of the Big Island! LIVING ROOM: Bamboo furniture adds to the tropical feel of the high ceiling open living area which extends out onto the Lanai. There is an area to sit and enjoy the ocean views and the infinity pool, a more private area to engage in conversation, and an entertainment area to enjoy the surround sounds of TV, a movie from our DVD collection, or relaxing music on our Bluetooth sound bar. DINING: Enjoy the sunset while sipping Mai Tais on the whale watch tower. Don't forget to look for the 'green flash!' Dine at the six seat bamboo dining table that borders the lanai with open air ocean views, sit for pupus (appetizers) at the granite bar, or take dinner out to one of the ocean side teak tables to enjoy the sound of the dramatic nearby surf while dining under the bright Kona stars. The experience is mystical! Stunning oceanfront views from all rooms includes: Master Suite: Entire spacious second floor with private outside entry, wrap around lanais, private sitting area overlooking pool and surf, private sitting area overlooking lush gardens, private whale watch tower. The Master Suite is truly spectacular! Master Bedroom: King size hand made Bali Style Coconut Bed with tropical netting and grass roof overlooking the ocean. Sleep to the gentle sound of the Kona surf! Master Study: Teak desk, fax/copy machine, DSL, printer, teak and leather lounge chairs w/TV, wet bar & refrigerator. Scenic ocean views! Master Bath: Exquisite marble throughout w/tropical indoor/outdoor shower, double vanities, teak makeup vanity, separate water closet, and Jacuzzi spa overlooking the crashing surf. Whale Watch Tower: Private nautical spiral stairs take you to a spectacular panoramic lookout of the picturesque Kona Coastline, the waterfront village and the inland volcanoes. TWO GUEST SUITES: (sleeps 2 in each suite, 4+ Total) Tropical gardens and waterfall views includes: Guest Suites: One separate building with two separate outside private entrances. Makai Bedroom: Banana leaf thatched ceiling with lanai overlooking the tropical gardens and waterfalls. Queen size hand carved teak poster bed with tropical netting, separate sink in-room vanity, closet, cable TV, ceiling fan and sitting area. Mauka Bedroom: Banana leaf thatched ceiling with separate entrance, lanai overlooking the tropical gardens and waterfalls. Queen size hand carved teak poster bed, separate in-room sink vanity, closet, cable TV, ceiling fan and sitting area. Bath: Large all-marble dual-vanity bath with shower, tub, and separate-room watercloset. Shared by both guest rooms (separate entrances). Private lanai overlooking courtyard gardens and waterfall includes: A separate cottage with high ceilings, its own full kitchen, pass through eating bar, private lanai patio with dining table, full bath, desk, sitting area, closet, cable TV, ceiling fan, and a Queen size hand carved teak four poster bed with tropical netting.Bath: Full tile and teak bath with vanity, tub and shower. PLEASE NOTE: This is a tropical home with open air louvered windows---there is no need for air conditioning as the nearly constant ocean trade winds fan a delightful gentle breeze from over the water during the day and from the mountains at night. You'll enjoy the natural tropical feeling!!! We purchased this lot and designed and built the home in 2000. The home was built and is maintained with the warmest Aloha spirit and we look forward to sharing this with our guests. This one of a kind Hawaiian ocean front home is ideal for creating family memories that will last a lifetime. The cool kona breeze and the smell of the salt air while basking in the panoramic view will be vivid reminders of your unforgettable stay on the Big Island. 3.5 Unique Custom Baths! From the luxurious one of a kind semi-outdoor master shower with Pulse Spa overlooking the surf, to the romantic jetted Jacuzzi with beach views to the grand bathroom with vaulted ceilings surrounded by warm marble tile and rain shower faucet, to the eight custom marble vanities with bamboo style faucets, the bathroom experiences at the Hale Kona A'ekai are extraordinarily tropical! Less than a one mile stroll to the famous Ali'i drive! Expansive views of the largest body of water in the world is all yours. Right on the beautiful lava and white sand beach! Crescent shaped white sand beach and lagoon only steps from the home along the beach path. Right out front is a lava and white sand beach. Awesome views of Hualalai Volcanic mountain right behind the home and Mauna Loa, the world's tallest mountain in the distance. Panoramic coastal and ocean views! Directly oceanfront with unobstructed views! Community track just a short walk south with outdoor workout bars and benches along the route. Media room and sitting area for relaxing and watching local Hawaiian channels or one of many cable channels and library of DVD's as well as book library for relaxing by the pool with your new Novel! Side by side spacious refrigerator and beverage cooler in Kitchen. Additional full refrigerator in the Ohana and a wet bar with mini fridge in the master suite. NEW 5 top burner with Griddle, warming drawer. Chafing dishes in pantry. Full tropical gourmet kitchen with breakfast bar, kitchen island with separate vegetable sink, triple Jenn Aire stove top, double convection oven, warming drawer, built in microwave, dishwasher, pantry and much more....all with an incredible oceanfront view! 5 Smart TV's, one in each room and large TV in Media room including DVD library. Jurrasic Park like Courtyard with waterfalls, misters and giant foliage. Espansive gorgeous flagstone patio which runs from the driveway through the courtyard and out around the pool area and down to the 'floating' dining pedestal beachside. We often have snorkel gear in our pool toy box. Inquire prior to arrivial for latest selection. Near by free tennis courts. World Class Golf courses near by. From the garage to the pool the main floor has no thresholds to navigate. RIGHT ON THE OCEAN!!! Just steps down beach path to the crescent shaped White Sand Beach & Lagoon ocean swimming and snorkeling! 4 Tiki Huts to enjoy! Private Oceanfront Infinity Pool, 4-Waterfalls, 3-Ponds, Lush Landscape, Private 'Jurassic Park' garden, Outdoor Shower, Outdoor Gas BBQ & Sink, Ceiling Fans, CD/DVD Player, Dream Kitchen, MW & DW, 3-Refrigerators, 4-Ice Makers, 2-Convection Ovens, 6-Stovetop, Warming Drawer, W&D, Jaccuzzi Overlooking Kona Surf, NO PETS, NO SMOKING & NO HOUSE PARTIES! Free HIGH SPEED coconut internet!!! Beach toy box full of rafts, floaters and pool toys! Baby chair, crib and baby gate available!, It is a short ten minutes from the Kona Airport to your magical Hawaiian vacation home! Gorgeous white, black and even green sand beaches, lush tropical valleys, rain forests and arid lava landscape await your discovery, Its an incredible adventure, Come and experience the Aloha spirit---come to the Big Island and be our guest! Felt like our own private island. Loved the house. Sheree was excellent to work with. This home is absolutely amazing. It is so impressive as soon as you walk in and it doesn't disappoint through out the home. We were a family of seven (5 adults and two kids) and we had a great time staying here during our vacation in Kona. The views are spectacular, we saw whales, dolphins, flying fish, and many many boats right from the home. We enjoyed sitting by the pool, on the balcony, in the whale watching tower. It just was fabulous. The Queen's Bath beach is so close and was perfect for my 7 year old and 1 year old. We went there numerous times throughout the week. The house is in a perfect location so we could easily drive to shops, dining, and activities. There were many pool/beach items for our use which was great. The guard-gated community makes you feel so safe, and we even met some of the neighbors who were really nice. The open outdoor concept is beautiful for hanging out in the main house and cooking and lounging. We loved it. Sheree and Kristen were fantastic. Sheree always quickly responded to my questions leading up to our stay and Kristen was great at responding to my questions/requests during our stay. Thank you for a lovely stay. We plan to visit again in the future. This house is absolutely amazing. It’s even better than the pictures, with the doors opened and the sea breeze coming through, truly wonderful. There are basically three separate sleeping areas so everyone has some space, and then a nice big open living space to gather. We never left! We are so thankful for this wonderful vacation at your beautiful home. Everything was absolutely perfect, the house was so comfortable for our family of 6 adults and 3 children. We loved cooking together, hanging out at the house, swimming, walking down to the little beach nearby. The location was absolutely perfect, we were able to walk into Kona and hang out st some of the restaurants. Love the Kona brew restaurant - perfect for our family. We had the best vacation and can’t wait to go back. Thank you for making our vacation absolutely perfect. Amazing from beginning to end. Perfect for so many groups but 4 couples would be fantastic. All the bedrooms are away from one another allowing for privacy but the MEET UP room was so perfect. We loved our time in the kitchen and living room where all you could see was the endless pool and ocean, while listening to waterfalls in the court yard. The kitchen is completely stocked and we ate fabulous meals together twice a day. Honestly, you do not have to go sight see anything.....Just grab your morning coffee, your afternoon cocktail and your evening wine. Life is good! We will most definitely be back! I hesitate to write this review only because our family wants to keep this place our little secret. We will definitely be back. We are a family of five adults and 1 baby grandson (18mos.) By far, this has been one of our best family vacations yet! And that's after three charter bareboat trips to the BVI's, which we thought was pretty spectacular at the time. This is five star luxury living in a very private setting. Our trip was flawless from the time we booked until the moment we returned to reality. Sheree, the owner was very quick to answer all of our questions and suggest activities. Keiki beach, one of our favorite hangouts, is within walking distance. It's hard to find good beach access in the Kona area but this little beach was perfect, not just for the baby, but for the rest of us as well. When we weren't spending time in the beautiful infinity pool watching the waves crash just 50 yards beyond us, we were at Keiki beach snorkling and watching for sea turtles, which we did see on our last day. The accommodations were extremely comfortable and the house was a great layout for our family. Our single adult son had the apartment over the garage with his own entry, kitchenette and patio. Our adult married son and his wife with the baby had the two rooms downstairs, divided by a huge jack and jill bathroom and my husband and I were in the master bedroom upstairs with the outdoor shower. This place is AMAZING! I'm reliving it all over again in my mind as I write this. The property manager Kristen, met us at the gate with beautiful flower leis promptly at 4pm and gave us the tour and her cell phone so if we had any questions or needs we could call/text her at anytime. And she responded throughout the week very quickly. The blender gave out midweek on a batch of margueritas but Kristen had a new one at the house before we were ready for the 2nd round! The only thing I can think of that would be a negative was not finding a knife sharpener in the kitchen drawer. My husband has a thing about sharp knives when he's cooking. We did most of our cooking at the house, but that's not to say there were not good restaurants close by. We started our trip at Kona Brewery for lunch and ended our trip there plus one night out at Huggo's and another for a luau. Added bonus: Kona Village is within walking distance! Loved our strolls downtown for shaved ice and shopping with the little one. World Class Golfing, Deep Sea Fishing, Awesome Snorkeling/Scuba, Volcano Viewing, Waterfalls & Tropical Gardens, Award winning White, Black and Green Sand Beaches, Submarine Rides, Dinner Cruises, Hawaiian Luaus, Kona Coffee Farms, An Olympic size public swimming and lap pool is free and open daily just 1/2 block outside our gated community!, So just relax in the luxurious surroundings, enjoy the adjacent white sand beach and lagoon, explore the village of Kona or venture out to one of the endless Big Island adventures, Eleven of the fourteen world climates are found only on this very unique island! The largest of the Hawaiian Islands has it all!